It’s no surprise that stripes featured in Spring/Summer collections this year but – and I hate to disappoint you – it isn’t just about your staple Breton tees. 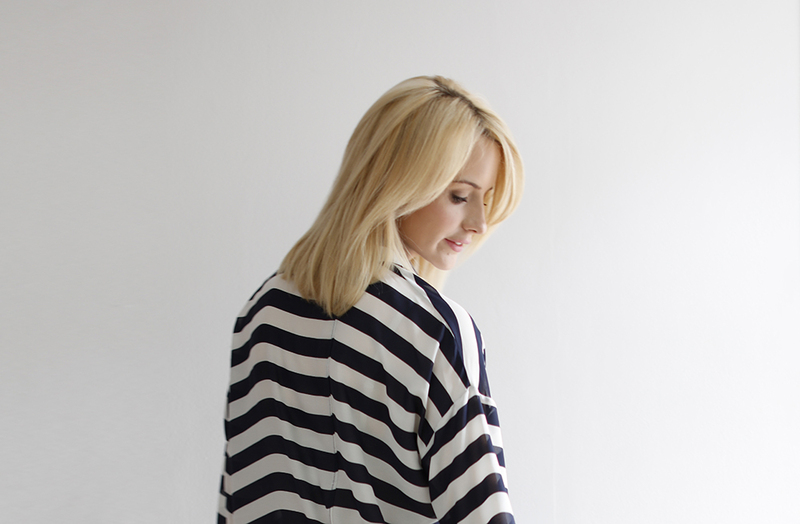 Think big and bold and look for alternative ways to wear your stripes this season. Varied directions, contrasting colours and stripe-on-stripe outfit combinations all proved popular on the catwalks but if you need to ease yourself in gently (and I’ll let you off for now as we’re not quite warmed up yet, weather-wise) try a bold block stripe in classic navy and white. It’s the versatile colour way we know and love, while upping the ante with wider stripes for a linear look that puts a big tick in the trend box for this season. The shirt is a strong shape for the season with updates including ruffles, pleats, tunic shapes and flared, extra long or wide sleeves making a statement to elevate the humble shirt to new levels. This shirt features a split back (only from the hem to just below the waistline) to add interest along with wider-than-average sleeves and a dropped shoulder. If you have broad shoulders in relation to your hips, what we call a Strawberry or Inverted triangle, a dropped shoulder seam will soften. Wider sleeves will instantly make arms appear slimmer and sleeves that finish at the point which your forearm is narrowest will flatter and elongate arms and wrists. Red may be the obvious choice for a bag to complete this look, but why play it safe? 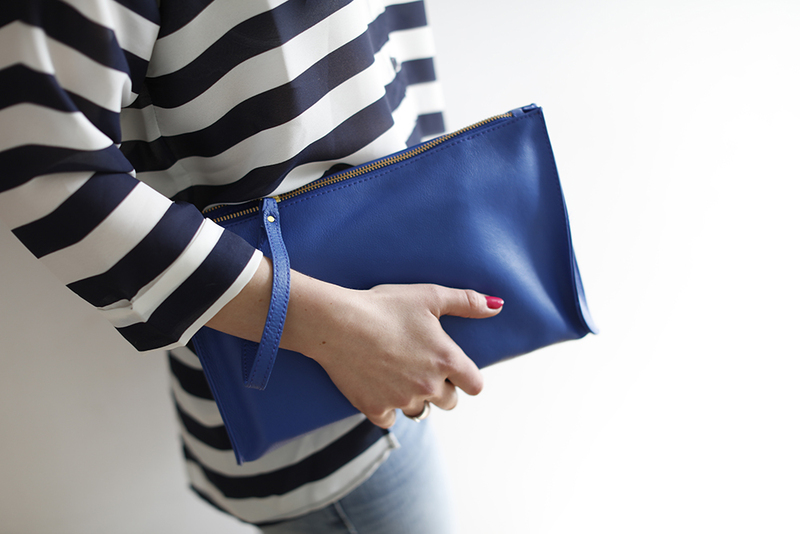 This cobalt blue leather clutch adds bold colour without being matchy-matchy, something which can instantly date an outfit. Pointed toe shoes and narrow t-bars will elongate the legs, just be sure to adjust your trouser or jeans hem to sit at the slimmer point just above the ankle for a polished and flattering finish. For a relaxed look idea for the school run and mum duty, just add a flatform loafer or white trainer but be sure to keep your jeans hem just a smidgen above the ankle as mentioned above. Choose a watch or bracelet to add subtle detail to the wrist and embrace the three-quarter sleeve length. Shirt, bag and shoes all c/o Kaleidoscope as featured in Kaleidoscope’s new season #SoakItUp campaign. Watch the video here. Get you! 😉 Shirts are great because they skim nicely and look smarter than a t-shirt. In a looser relaxed/tunic style they’re just as comfortable!